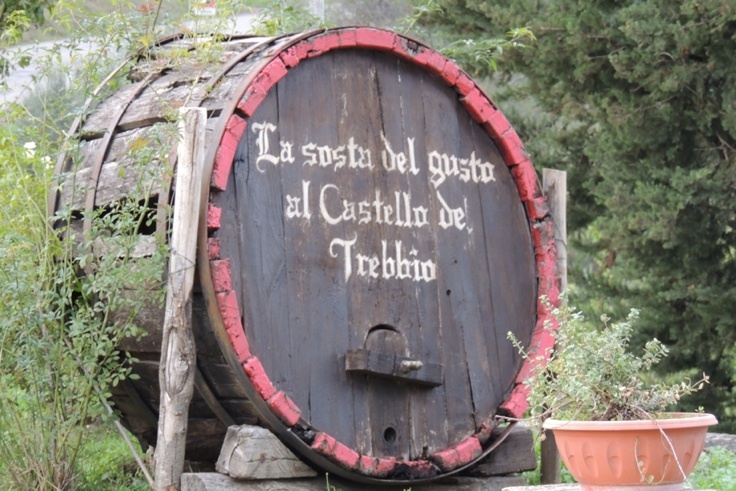 Nestled in the beautiful Tuscan hills, not far from Florence lies the farmhouse and surrounding farm of Castello de Trebbio. Built by the Pazzi family in 1184, the famhouse, or castle as is probably best describes it, strikes an imposing figure in the little village it’s located in. The Pazzi family were renaissance-era Florentine bankers who were second in power to the Medici family. On the 26th April 1478, the eldest Pazzi brothers Salviati and Francesco (with the blessing of the current Pope), plotted to kill Lorenzo and Giuliano de’ Medici. They succeeded with killing Giuliano during mass, although Lorenzo escaped. As a result the Pazzi family were stripped of its nobility, its land and investments, and its seal removed from every public space in Florence. Most of the family were hung to death in public spaces. Salviati was hung from the Palazzo Vecchio, where Leonardo di Vinci sketched his lifeless body. After that event, the Medici family took over Castello de Trebbio, and transformed it into a villa. It has had various owners over the centuries, and its current owners have been in residence since 1968. The villa’s surrounding farmland has 60 hectares for grapes, and around 10,000 olive trees. Saffron is also grown in the fields. Castello deTrebbio main produce is Chianti Superiore. 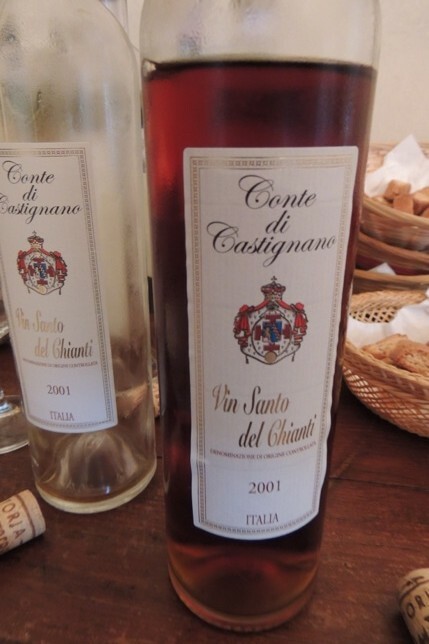 As stipulated in the Denominazione di Origine Controllata e Garantita (DCOG) guidlines, the winery can use the Chianti name as the grapes are grown in the Florence region, and the wine blended with at least 80% sangiovese grape. 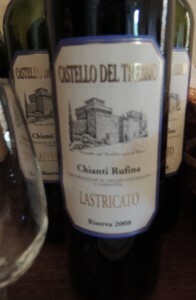 Although they use a 100% sangiovese grape. 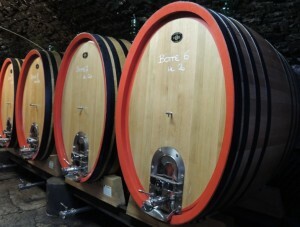 They also produce a grigio / reisling blend, with wine production totalling around 300,000 bottles a year. Throughout the villa, the history and previous uses of each room are felt. The room where the plan to kill the Medici family leaders had the remnants of its outcomes, with a defaced coat of arms over the fireplace. 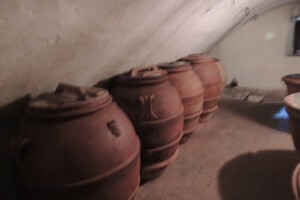 Barrels of wines are kept with hooks on the walls used by the Pazzi family’s army to restrain prisoners. The notable people who have had associations with the winery are also present. 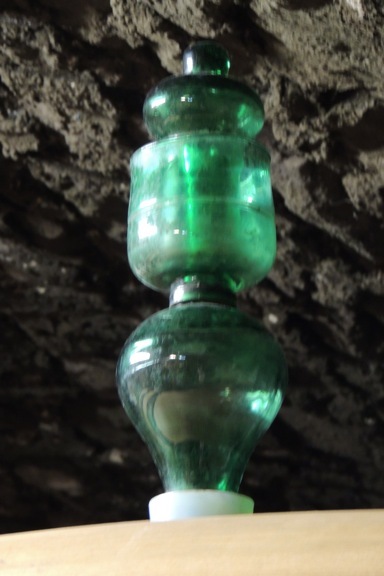 On each wine barrel, there is an upturned glass bottle sticking up from the top. 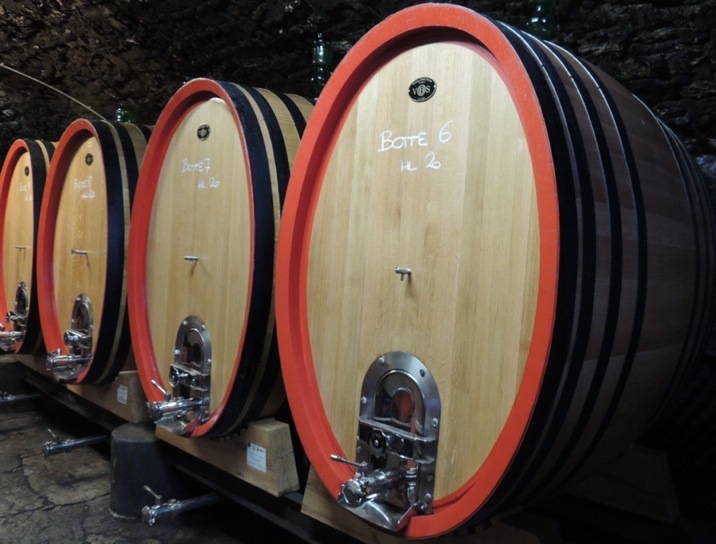 This was designed by Leonardo Da Vinci, to enable the wine makers to peer inside each barrel to view the contents without opening it. There is one seal of the Pazzi family that was kept from being defaced, which is located in the courtyard. This is because it was sculpted by Donatello himself. 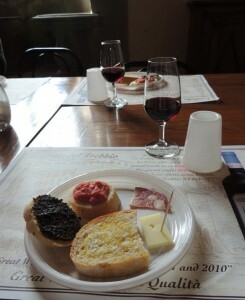 And, at the end of the tour, a few wines and food were tasted. 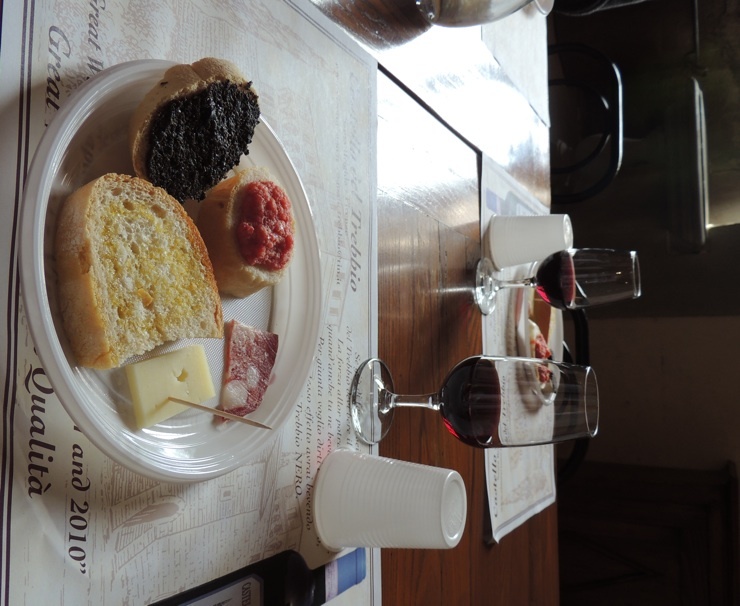 A platter of food with spreads such as olive from their own trees spread on ciabatta was tasted. 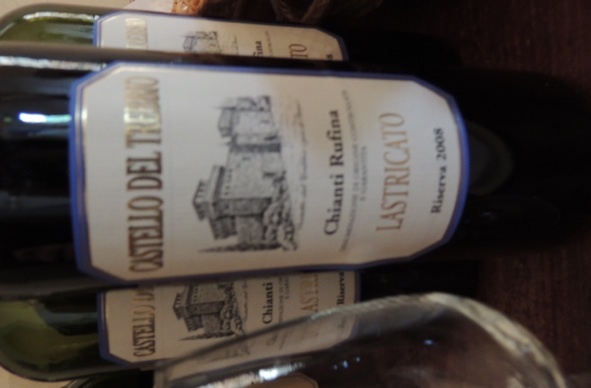 This was had with a glasses of their reds – the Chianti Rufina Riserva Docg 2008 Lastricato and the heavier, more blackberry flavoured Annata. The desert wine of Tuscany, a Vin Santo was also tasted. Made from the trebbiano toscano grape, a biscotti is a traditional pairing, being dipped into the glass.